The problem with being Dutch is that everything is very well regulated. Everyone eats at 6 pm and has the kids in bed at 8 pm. It works really well, as long as you’re in the Netherlands. When you go elsewhere, it’s cultural jet lag. Nowhere is it more true than in Spain, where no one eats until 8:30 at the very earliest, and kids don’t go to sleep until at least 10 pm, later on weekends. But our kids are Dutch. So, on the first night we were there we headed into the old town to try and find food, knowing that a restaurant meal was out of the question. In Bilbao, though, they’re all about the pinxtos, the local version of tapas. It’s like a continual cocktail party. Each bar, and they are everywhere, has their offerings to see – go in, pick what you like and pay per piece – and you can do it any time of day. Each bar apparently has a specialty and left on my own, I would have explored them all. But tired kids are not adventurous eaters and so we only got a few in, just enough to fill our bellies before we headed up to our campsite. When, I say up, it was up. There is a camping space for motorhomes on the very top of one of the hills overlooking Bilbao – very nice and secure, and €15 per 24 hours. We made it up there, checked in, and all went quickly to sleep. The next day we were still pretty tired and took it slow. We headed into town, got some bread and cheese and explored the local juvenile infrastructure. The playgrounds, that is. Bilbao has some great playgrounds. We did a series of family selfies. And we had to try our first chocolate con churros. We also saw what looked like brand new cycling infrastructure, but while they seem to have taken some best practices from the Dutch experience, they are lacking arguably the most important, the network. The cycle paths are lovely, but they don’t connect with each other. It wasn’t until the next day that we got to the main attraction of Bilbao, the Guggenheim. It is definitely an interesting building and we walked all the way around it before heading in for a look. I’m not a huge modern art fan, but there were a few interesting things other than the building itself. And the kids kept themselves entertained with the audio guides – not sure how much they got out of the high-faluting art talk, but some of it might have snuck in, and it amused me to no end to see them intently listening to the explanation of a painting that was a swath of black with white in the corner. And one last playground outside the Guggenheim. We had thought about then heading to the Caves of Altamira, but they’re closed on Monday. Since the only place in Spain with a rain cloud on it was the Bilbao corner, we decided to skip the caves this trip and head for Burgos and the famous cathedral, and more importantly, sun. Burgos being only an hour and forty minutes away, we wanted to eat quickly and get on the road that night, but it was hard to find somewhere we wanted to eat, so we settled for pizza and headed out to Burgos. And instead of chancing another closed campground, we stopped along the way at a motorhome parking place, for free. When we woke up, we saw sun, and that was enough. Of course, we were the last ones gone from there too after oatmeal for breakfast, but we were in no rush. 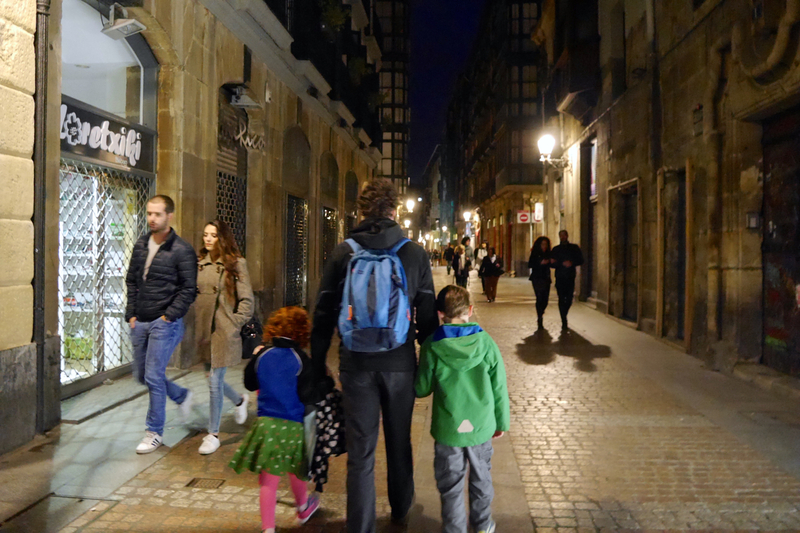 We got to the campground in Burgos, and the kids decided that we were just going to stay there that day – they’d had enough of tromping around cities for a bit, and wanted to rest. Fair enough. It’s all good in the sun.